Sometimes, the toughest part of raising money is getting kids to participate. You don’t want to get stuck with a fundraiser that the kids don’t care about, because turning a profit will fall completely on your shoulders. Nobody likes standing on a soapbox week after week, asking kids to raise more money with a boring fundraiser. These are some simple fundraising ideas that even younger kids have fun with. Fundraising safety with adult guidance is always a must, but the bulk of the effort should be left to the kids. After all, they’re the ones that will benefit most from the fundraiser! An art show is an easy fundraising idea that you can start and finish in your school building. Ask students if they would like to participate in an art show for a small fee (like $5). Students can paint, draw, and craft artwork to sell at an auction. For younger kids, you may want to provide a little guidance for the content of their artwork. Portraits of celebrities, superheroes, and landscapes are all fun ideas. An art show is a simple fundraising idea because there is very little upfront cost, kids have fun making the artwork, and you don’t have to rent a space to have the auction. As long as your principal is up for an interesting day at work, this one’s easy for everyone since there’s no real work involved. Creating your own "Olympic" games is a fun and simple fundraising idea that can work for schools, offices, and extracurricular organizations. Each event can be scored individually, so there can be multiple winners. It may be a good idea to diversify the games so all students can enjoy participating, whether they’re athletically inclined or not. Charge each participant an entry fee to participate in your challenges. This can be a single fee to participate in all events, or several small fees to participate in each event. You can also sell snacks at a snack stand during the "Olympic" games. World’s Finest® Chocolate: Easy and Profitable for All Ages! Kids of all ages can get excited about chocolate. With $1 and $2 bars, their donors won’t want to turn them down either. Plus, we offer amazing prize programs that keep kids motivated to sell. 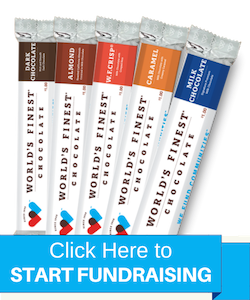 World’s Finest Chocolate is not only a profitable option, but it’s also one of the most simple fundraisers available to you. You get help from start to finish with your own local fundraising representative at no additional cost, and your chocolate ships in as fast as three days. See how much money you can make in just 2-3 weeks with our fundraising profit calculator! Keep things simple with World’s Finest Chocolate.